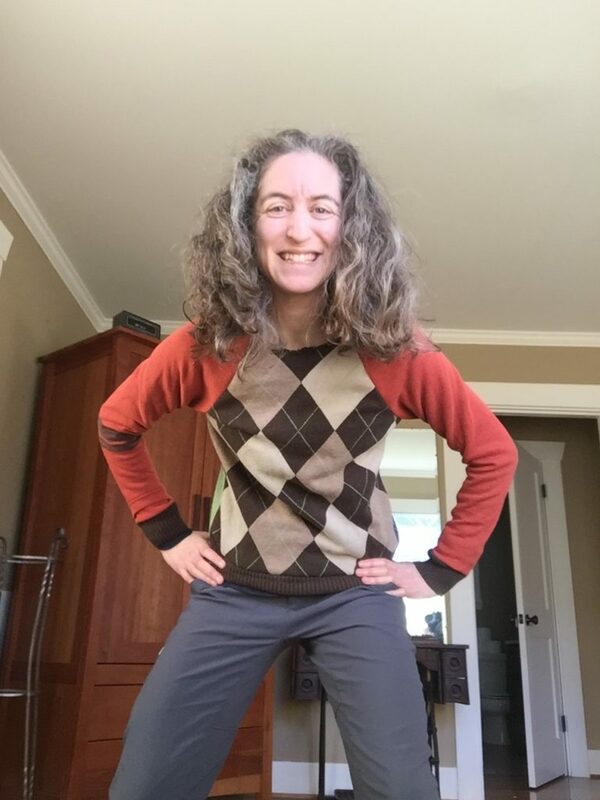 On my first trip to Value Village back in January, I picked up some men’s cotton knit clothing, including an argyle vest in earth tones, a casual orange sweatshirt, and a mint green vest. Sorry, no true “before” photos exist. 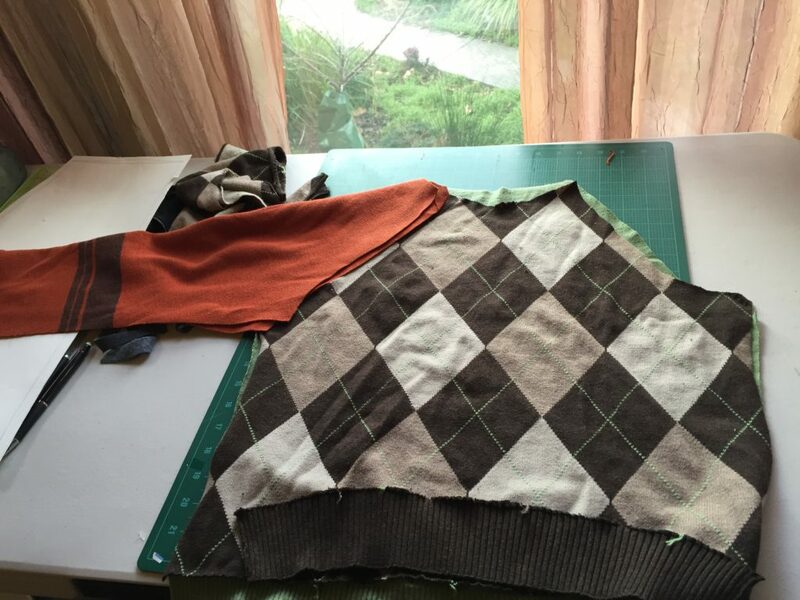 I used the basic raglan pattern that I had created from the original sacrificial jacket, and cut out all the pattern pieces using my rotary cutter. 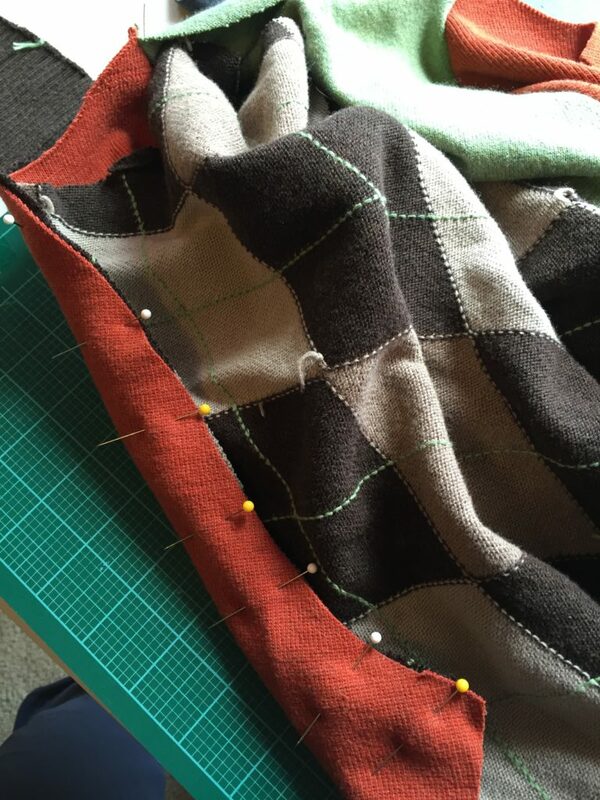 As I carefully pieced it together, I could tell that it was going to be a one-of-a-kind garment. It was during this project that I started to realize the true potential of converting shirt fronts to sleeves. Because raglan sleeves go all the way to the neck, they are long pattern pieces and require a lot of fabric. With all the XL source garments, I had some amazing options for sleeves. In order to squeeze enough fabric out of a shirt front, you can even include the front placket, or in this shirt’s case, the crew neck. I was able to incorporate that detail into the right sleeve just above the brown cuff which itself was taken from one of the waistbands. In the past I have found it difficult to find mass marketed set-in-sleeve shirts to fit my wiry frame. I can either have a slim fitting shirt with too-small shoulders or a loose fitting shirt with shoulders in the right place. It seems as if raglan sleeves give a lot more flexibility for different shoulder widths. And I like how they accentuate the shoulder area.